This is a one bedroom cabin with a king bed. It has a nice view of our park-like property. There's a great little lawn area with a picnic table for barbecue's! 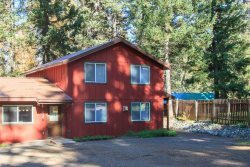 This cozy little cabin is close to the lake and a lot of the Wallowa Lake activities including restaurants, the Wallowa Lake Tram, miniature golf, and more! You can watch the deer as you eat your breakfast on the deck or relax in the sun on summer afternoons. This cabin is in a great location and is perfect for couples who want to explore the Eagle Cap wilderness or who just want a vacation from day to day life. Come stay in this cute cabin and enjoy a wonderful adventure at one of the Seven Wonders of Oregon, Wallowa Lake.